Enter linear inequalities. For me, there is almost nothing worse than teaching graphing linear inequalities. Even when students can graph, the test point alludes them, no matter how many times or how many ways I explain it. It seems like such an abstract and foreign concept to them, especially at first. Until now. Thanks so much to Misty Carver for all of her ideas and links! Our 7th grade students knit scarves for patrons of the Mooresville Soup Kitchen every year during the holidays. To begin linear inequalities I proposed a business. Our Woodlawn students were going to knit scarves and afghans to sell, and donate the proceeds to charity. I put them in groups to brainstorm what they would need. They created lists and came up with great questions. They generated a terrific list of things they would need. Thanks to Google, we found out how much a skein of yarn costs, and how much yarn it takes to make an afghan (they knew how much yarn it took to make a scarf from experience). They all have knitting needles, so we were able to take that out of our expenses. I then told them that Woodlawn school would donate $840 dollars for supplies. I had them come up with scarf and afghan combinations that they could buy for $840. I also had them come up with a combination that amounted less than $840 (in case we had unexpected expenses or wanted to buy snacks), and a combination that was too much money. Once they had their combinations, we put them in three different tables on Desmos.com (my new favorite website!). We made a table for combinations that equaled exactly $840, one for less than $840 and one for more than $840. Desmos is an amazing tool as we were able to make each set of points a different color. After we entered our numbers, I had the students tell me what they noticed and asked if they had any wonderings (thanks so much Max!). Thanks to Desmo’s colors, it was easy to see that all of the combinations that equaled $840 created a straight line. So, we connected this line. After connecting the line, it was very obvious that combinations under $840 all fell under this line, and those above $840 were above the line. We wrote the equation of that line together and then I had them watch me while I changed the equals sign to the <= sign in Desmos. There was an audible gasp in the room as the bottom filled in. Students exclaimed, “Oh my goodness, EVERYTHING in the orange area works!” as it dawned on them what had happened. They couldn’t wait to see how to do it themselves and really realized what was going on. Never before had “test points” seemed so obvious to them. Test points were not just random points, they MEANT something, they told a story. The next day, when we finally got to the actually inequality lesson, foldable, and then homework, the students really understood the need for a test point. They also easily understood the horrific workbook word problem. Honestly, even I still can’t believe how well this works. It is truly, “math-a-magic”! So please, if you can, begin at the end and save the math for last! Thanks so much to Desmos.com for all of their help via Twitter! They are an amazing, consumer friendly product and we use it daily in our class now. I still can’t believe that it is free! You are so cool. So very cool. I have never heard of this website. I was just playing on there a little bit and I LOVE it! Thanks so much for sharing. My students and I will be graphing inequalities soon and I plan to steal your idea here. Thanks!! You’re so welcome! I heard about it at Global Math and have used it ever since! I love desmos! And I agree, Julie, they are so helpful and responsive on twitter. I had my precalc kids graphing polar equations this week using desmos and they were very quick to respond when we were having browser problems. I loooove how easy it is to use their sliders, too! I just noticed the sliders yesterday! I can’t wait to play with them. I’ve been “starting at the end” a lot this year too (not every topic, but a bunch of them). I’ve found some good ideas from 101qs.com and blogs (like this one). But do you have any other good sources for starting points like this? Sometimes I’m stumped and that causes me to revert to my old (boring) ways! This is my GOAL, for 7th grade especially, but I’m still in infancy as well. You just gave me a great idea though. It would be great to have a resource that gives us ideas that we could use for each topic to “start at the end”. I’m going to work up something this weekend. Maybe a shared gdoc. We could all share activities that we used to start at the end for different topics. We wouldn’t have to have resources – but we could include them if he had them! Thanks for the inspiration! Great idea! I’ve tried to share what I have on my blog, but I definitely don’t do a post on every topic. Thanks for the great blog. I have had similar goals this year, of putting the “math last.” I am trying to answer, up front, the question of “When will I ever need this?” When all else fails (or I am short on time), I just take a word problem from the book and put it first in the teaching lesson rather than leaving it to the end. What a fabulous idea! My advanced sixth graders will be graphing inequalities soon, so your lesson will help immensely. I’m going to talk our Student Council sponsor to get some of real world problem solving ideas they’ve experienced. Isn’t it funny how, when you have an idea about something, you suddenly start seeing it EVERYWHERE!? Here follows a post which absolutely hits the nail on the head for me about CONTEXTUALISING MATHS (not simply giving them a so-called ‘real life’ question after they’ve learnt the topic, but making it fundamental to the whole experience of learning, start to finish). I love this- and I also really believe in leading with the problem and then emerging with the tools. 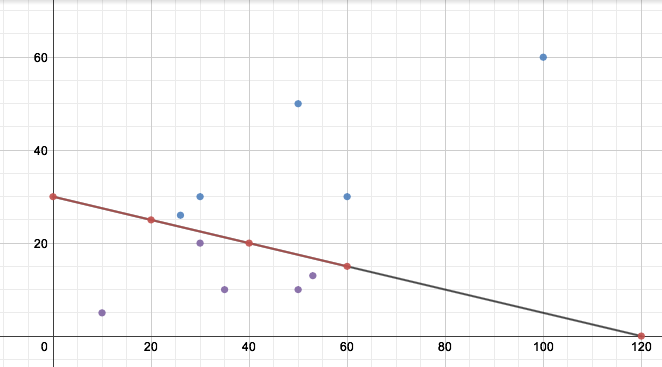 Quick questions- how did you make the line without writing the equation in desmos? Also- did you allow the compound equation (restricting to positive values) just slip in there, or did you draw that out?